There are many things that have changed in the complex world of BI. Some of that is the fact that no business is now willing to wait weeks or months creating a report and no one likes rocket science BI tools that only technical people or data scientists can figure out. These days it is all about empowering the non-technical user or business user. BI vendors are scrambling to offer a BI tool that is easy to adopt and that is affordable because they are all too aware that the future lies in low cost entry, self-service BI in the cloud. To break that down, we take self-service first. The rate at which businesses accumulate data is incredible and now is a time when the business that can squeeze the most insights out of its data flourishes so the goal of arguably all business is to ensure that they can be more strategic in accessing their information real-time so that their business can be more agile. In this sense, cloud-based and self-service BI tools are the most in demand. It is worth pointing out that it shouldn´t just be about self-service, it has to be flexible and easy-to-use for it to make sense. Next – low cost entry. A few years ago, only large companies could exploit their data but with the rise of cloud business intelligence tools, it is now possible for smaller businesses to use their data in a way they could not previously do. Subscription-based models now afford businesses of all sizes access to real time insights so that they can support their decision makers. Everyone one needs functional, operational, and compliance reporting of their operations daily and this has previously been where traditional BI flourished. There is also that need for dashboarding which was the reason why traditional BI tools were so popular. However, like most things, everything is changing. Businesses still want to be able to know what happened and what is currently happening in a standardized and scalable way but what significantly changed is the willingness of businesses to pay a huge amount of money for these abilities. This is why cloud-based, self-service BI is becoming even more popular. Businesses are looking for a highly scalable, centralized, standardized, consistent way of reporting with advanced analytical capabilities that do not necessarily require huge amounts of money. A subscription-based BI tool in this case makes a lot of sense. The future truly is in the cloud. We are past hesitation phase. Organizations these days are either starting to migrate to the cloud or are in the process of evaluating how they want to go about their migration. There are so many benefits of moving both FP&A and BI in the cloud. The advantages far outweigh the disadvantages so if a business wants a tool that is going to be around for a long time, it has to be in the cloud. Not to mention the fact that the costs of cloud-based tools are lower which is also one of the things most businesses want. 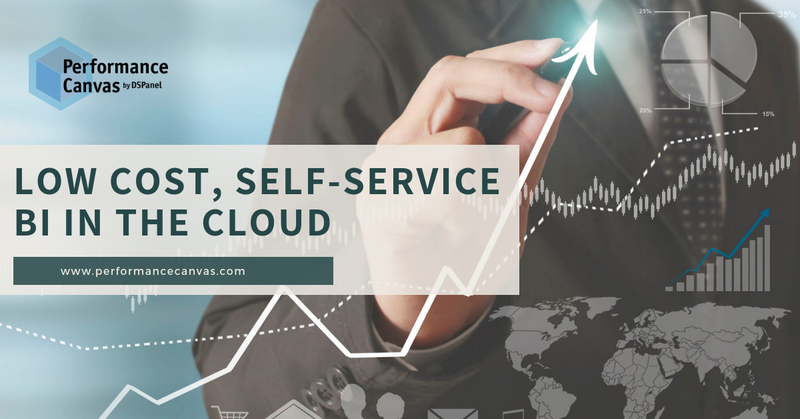 If you have been looking around and evaluating self-service BI tools in the cloud, you should know by now that not all self-service BI tools are created equal. Performance Canvas Financials is a complete, cloud-based FP&A software with strong BI functionalities that will allow you to access multiple data sets and allow you to have a single version of the truth in your organization that everyone can query. It is a specialized system that maps all of your organization´s data in a way that makes sense for everyone that needs access to it. This subscription-based BI and FP&A tool looks at the way you currently work and provides recommendations on how you can improve and automate it. It, of course, boasts of self-service reporting and analytics, easy to manage dashboards, and affordable entry cost. If you want to find out more about this low cost, self-service BI and FP&A tool in the cloud, visit www.performancecanvas.com or email info@dspanel.com.